The Atlanta Botanical Garden serves as home for more than just thousands of species of plants, trees, and flowers…a whole ark of animals call it home, too. Among the non-plant residents are a number of frogs, many from South and Central America, including: Panama, Colombia, and Suriname, to name just a few. On this particular visit, I joined 22 other visitors for a viewing of the daily frog feeding. 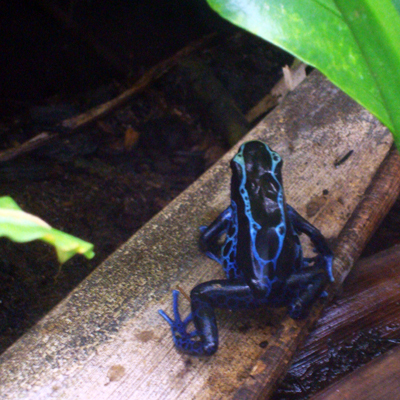 The group's members came from near and far and were of all ages, each eager to see the consistent crowd favorite…the bright yellow and vivid blue poison dart frogs. 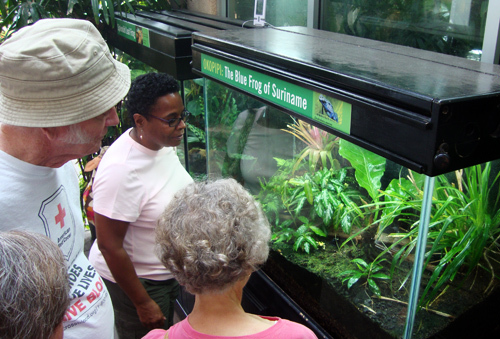 They were there to see the other species, too, as well as to learn about the Garden’s amphibian research and conservation programs. Robert was the amphibian specialist conducting the feeding and the discussion (as he was when I’ve previously attended a frog feeding). Robert is younger than you might imagine for a person who knows as much as he does about amphibians, but he delivers a strong confidence and a passion for his particular discipline. And he has a subtle, dry sense of humor that I and other visitors admired and enjoyed. He emerged from behind a door marked “staff only” with a canister reminiscent of something that an exterminator would carry, with the tell-tale stick nozzle for spraying. Robert assured us that the contents were not harmful to the frogs, that it was actually only distilled water. The water spray seemingly acted as a dinner bell. As soon as Robert started spraying the interior walls of the habitat, every single frog emerged…surely with the full knowledge that lunch was about to be served. Of course we were curious what the Garden feeds their frogs. After spraying, Robert returned to the back and returned with two plastic containers of…fruit flies—the frogs’ lunch. The different species have different diets. In addition to fruit flies, their daily food offerings include crickets, bean beetles, and cockroaches (yuck! ), as well as a few other totally gross items. When the little guys started eating their flies, I had a flashback to “Toad” from the movie “X-Men.” As little as these frogs are, their tongues are relatively long…and they were hungry! Zap here, zap there…full scale dining had ensued. 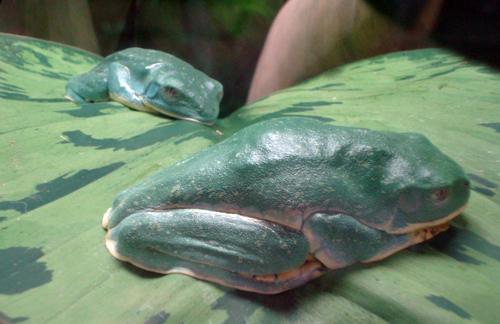 The frogs are fed daily, usually around 11:00 a.m. during the week and assuredly at 11:00 a.m. on Saturdays—the advertised frog feeding time. 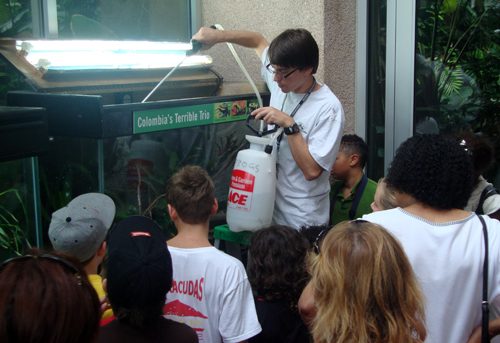 The feeding takes place just inside the Fuqua Conservatory on the right at the Amphibian Display. Also near the Conservatory lobby, also to the right near the restrooms, is a display of Georgia salamanders. Of the four species, one is found only on Pigeon Mountain located in the northwestern part of Georgia. While you’re at the Garden, look for the Giant Frogs (made of copper, I believe). They’re great to make photos with and they’re located throughout the Garden, but can usually be found just outside the Hardin Visitor Center, at the north end of the Great Lawn, and in the Children’s Garden. Part of the Garden’s frog conservation initiatives includes the frodPOD, a state-of-the-art research facility located on the Garden grounds near the Fuqua Conservatory. 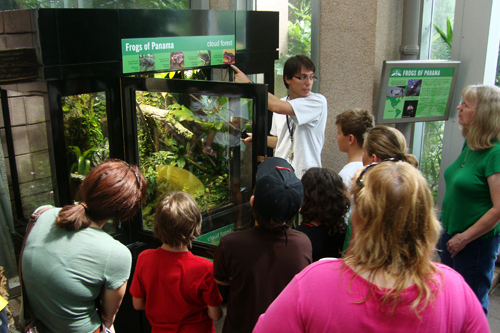 Unfortunately for us (but good for the 13 species of frogs living there), the frogPOD is not open to the public. 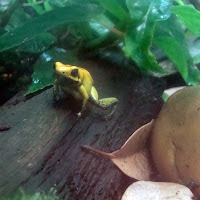 Darwin’s Frog is my favorite...it reminds me of Gonzo from The Muppets, but maybe a little more evolved. I hope to actually see one in the future...a Darwin's Frog that is. I can see Gonzo anytime I want at the Center for Puppetry Arts. If you do not live in the Atlanta area and you’re interested in the Atlanta Botanical Garden’s amphibian research and conservation efforts, follow their frogPOD Blog. There’s lots of interesting content there about what’s happening at the Atlanta Botanical Garden and around the (frog) world. Am I hungry for more frog feedings? I’ve been twice and both times it was educational as well as entertaining…I’ll definitely go again. 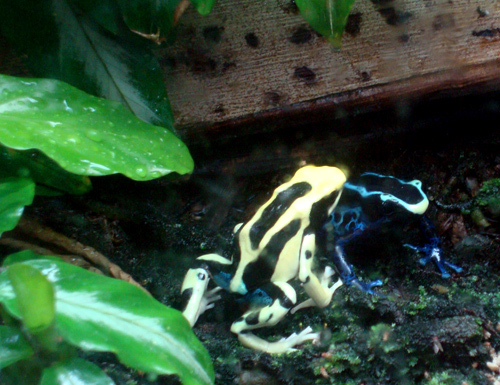 It’s the one time of day that you get to see (almost) all of the frogs in the habitat! If you go to the Garden during the month of August (2011) between 9:00 a.m. and 12:00 p.m., admission is only $10 if you bring a printed “Beat the Heat” coupon (or display it on your mobile device). 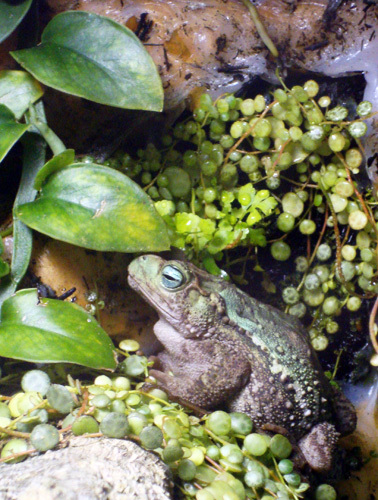 The frog feeding viewing is included with admission.